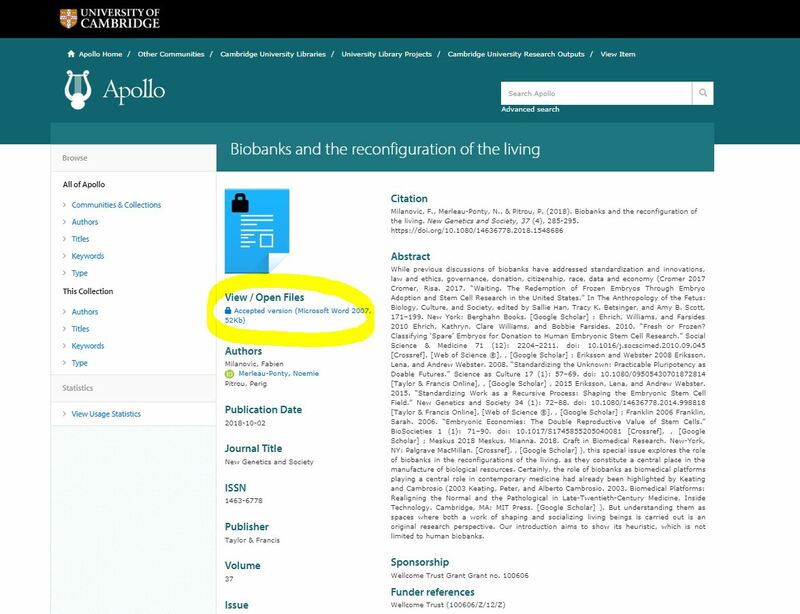 The 'Request a Copy' feature on Apollo, the University of Cambridge institutional repository, allows interested individuals to request a copy of a work which is under embargo (published or unpublished). As an institutional repository, copyright prevents us from making embargoed works available. However, authors are entitled to distribute embargoed manuscripts on an individual to individual basis, and this feature simply facilitates that contact. Our Request a Copy service was launched in June 2016 and has been gaining in popularity ever since. 1,744 requests were received on the first year, the large majority for journal articles (64%) followed by theses (31%). In 2017, we received 3,119 requests with journal articles being again the most popular items (54%) ahead of theses (41%). 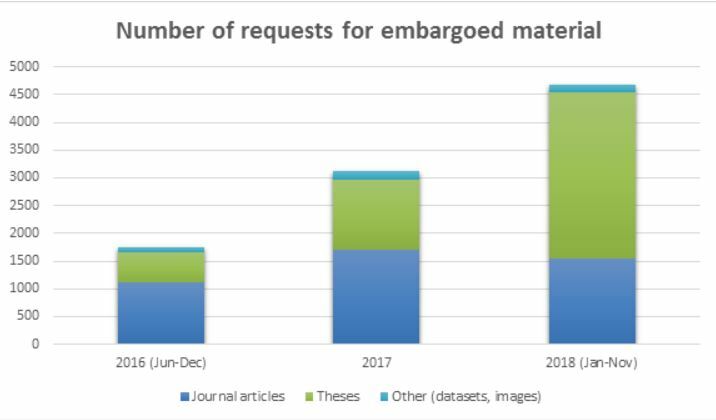 In 2018 a total of 4,669 requests were processed by our team, with theses making up 64% of requests and thus becoming the most requested research outputs. The figures are illustrated in this barchart. In total, we have received more than 10,000 requests for copies of embargoed outputs in Apollo, and this figure continues to rise. We have written a number of blog posts about the service, its implementation, some usage statistics, who is requesting what and what requesters want most from our repository and why. To request access to an embargoed file in Apollo, simply click on the file name with the padlock sign. This will direct to the Request a Copy form which must be completed to facilitate your request. You will need to provide your name and email address, which is the address to which the file will be sent should your request be approved. You will also need to write a message including information about who you are, your occupation, research topic if applicable, and why you are interested in this particular article, thesis or dataset. If there are other files attached to the same Apollo record, you can choose to request all files rather than submit a separate request for each individual file. Once you have submitted your request, it will be forwarded to the relevant person or department. It may take up to several days or weeks to receive a response, for example if an author is unable to check their emails for a long period of time. You may not receive a response at all, if they ignore the request. 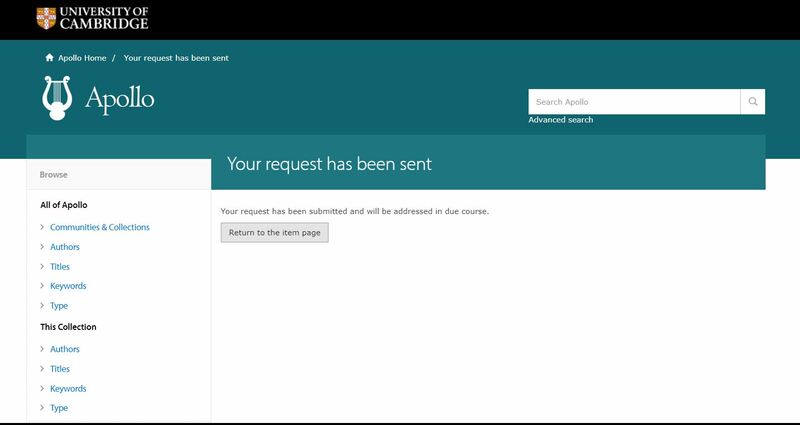 However please be assured that once your request is submitted and you see this, your request will be processed and sent to the relevant party. There is no need to submit another one. If you are requesting a controlled thesis, you will need to pay an administrative fee before a copy of the thesis is supplied to you. This is indicated on the request form. For information on access levels for theses, please consult this page. Once a request for a copy of your journal article, thesis or dataset has been submitted, the relevant authors will receive a notification email. This will include information about the requester (name and email address), the name of the work that has been requested, and the link to the record in Apollo. When the record holds several files, the email will indicate if all the files were requested. You can also see the message left by the requester which will tell you who they are, their occupation, research topic, and why they are interested in your work. Although we do prompt authors to make messages as informative as possible, the supply of information is entirely voluntary, and you may have to decide based on limited information. To accept or reject a request, follow the link provided in the email. You will be prompted to choose one of two options: ‘send a copy’ or ‘don’t send a copy’. Apollo will suggest a template message for each option, which you can customise. Whatever option you choose, the response will only go to the requester. If you choose to send a copy, the file will be automatically attached to your message and you won't need to do anything further. 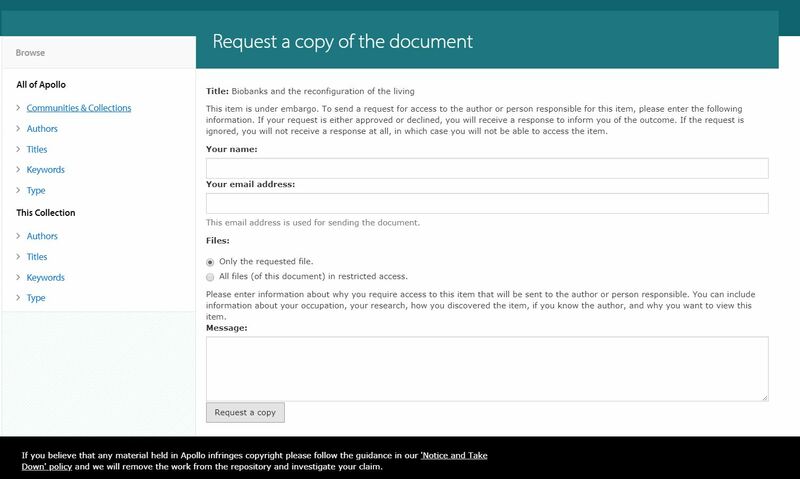 There may be instances where you might wish to email the requester directly to send them a copy of your work (e.g. to send the final published version of your article rather than the accepted version held in the repository record). If you have any questions about a request, you can contact us at support@repository.cam.ac.uk.